Note: Limited free onsite parking. Carpool, bus (#5), Uber/Lyft, etc. is a great idea. Some disabled parking available. Facebook event – Invite friends & family! Check out the fabulous article about Winter Festival that appeared in “The Mix” section of the Seattle Times on Sunday, November 11. Take a break from shopping and enjoy performances on two stages— from bluegrass, jazz, and holiday pop to Middle Eastern, Morris and Jewish dancing. Munch tasty lunch items, grab a Starbucks espresso drink at the Snowflake Cafe, and indulge yourself with a huge bake sale selection. (Cash or checks only, please.). New this year! Take a break and enjoy a mimosa, mulled wine, or a beer in our outdoor beverage garden. (21+) Beer provided by Figurehead Brewing, sparkling wine by Treveri Cellars. Visit all corners of the festival— Blue Building, Brick Building, outdoor vendors too! Get your event passport stamped in at least 5 out of 6 locations and be entered to win one of the many goodie bags with items crafted by some of our amazing makers. Get fresh holiday decorations at The Phinney Neighborhood Preschool Co-op wreath sale. The wreaths are responsibly grown in Oregon, and are a beautiful Pacific Northwest blend of freshly cut noble fir, blue berried juniper, cedar and natural pinecones. They are $25 each and the proceeds support the preschool and scholarship fund. Enter to win a one-of -a kind hand-made quilt crafted by Stash Busters. The quilt raffle is a Winter Festival holiday tradition and proceeds benefit PNA programs. Tickets are $1 or $5 for 6, and will be available in the Blue Building lobby and in the Phinney Center office before the event. Some lucky winner will get to take this work of art home after the raffle at 4 pm on Sunday. You do not have to be present to win. 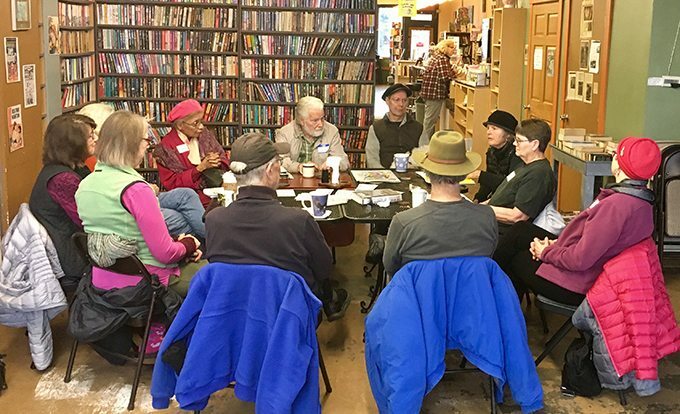 Not only are you supporting local artisans, you are also contributing to PNA’s nonprofit programs–such as a hot meal program, the Greenwood Senior Center, memory -loss programming, kids’ programs, a tool lending library, an art gallery, as well as numerous community projects, events, and classes. Check out photos from previous years on Instagram. SPREAD THE CHEER – VOLUNTEER! It takes over a hundred volunteers to make Winter Festival a fantastic experience for our visitors! From baking and decorating to helping vendors unload and keeping an eye on the toilet paper levels, each “job” is vital. Vendor applications were due Friday, August 17, 2018. If you’d like to receive an email when the process opens next year, please email Jessie at [email protected] with the following information: Full name, Business name, Phone number, Address, Email address, Website (if applicable). Thank you!